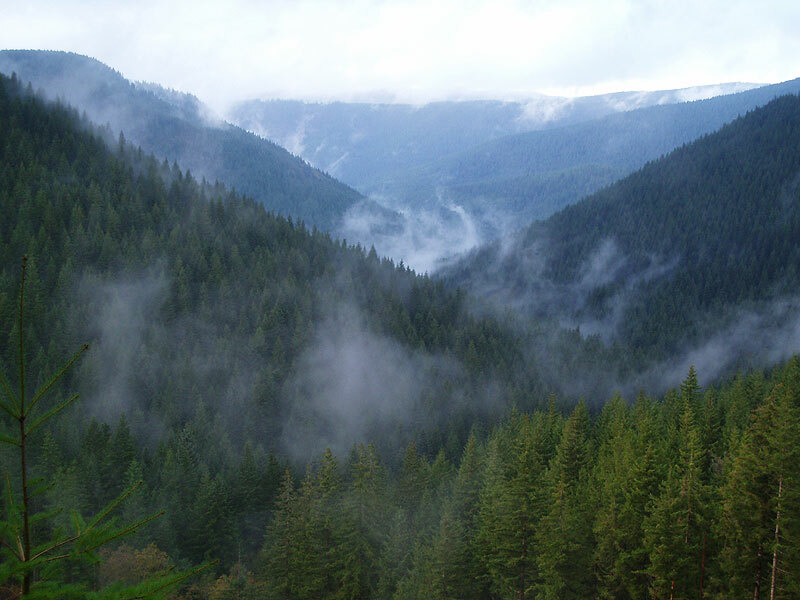 The Oregon Coast range is a mountainous version of the Bermuda Triangle. Gates appear, open, and close randomly. The famously incomprehensible road system is constantly evolving, so maps are only marginally useful. Even those who are experienced in land navigation can soon be hopelessly lost without a GPS. Tourists are regularly swallowed up by these mountains, and sometimes they don't survive the experience. Needless to say, for those who love adventure, this is a special place. Boulder creek is one of those heartbreaker Coast range creeks that lies in a drainage that used to be open to the public, but is now closed off for most of the year. Back in the day you used to be able to drive right to Boulder, but the timber companies now only open the gates two weekends out of the year, during Elk hunting season. 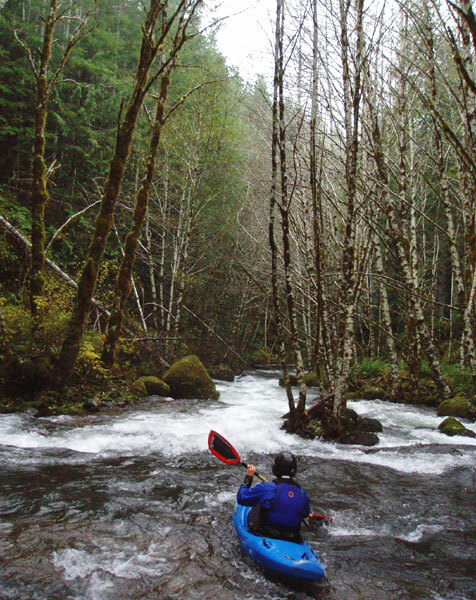 The probability that good flows will coincide with hunting season are slim, so Boulder Creek has fallen pretty much completely off the radar of the Oregon kayaking community. 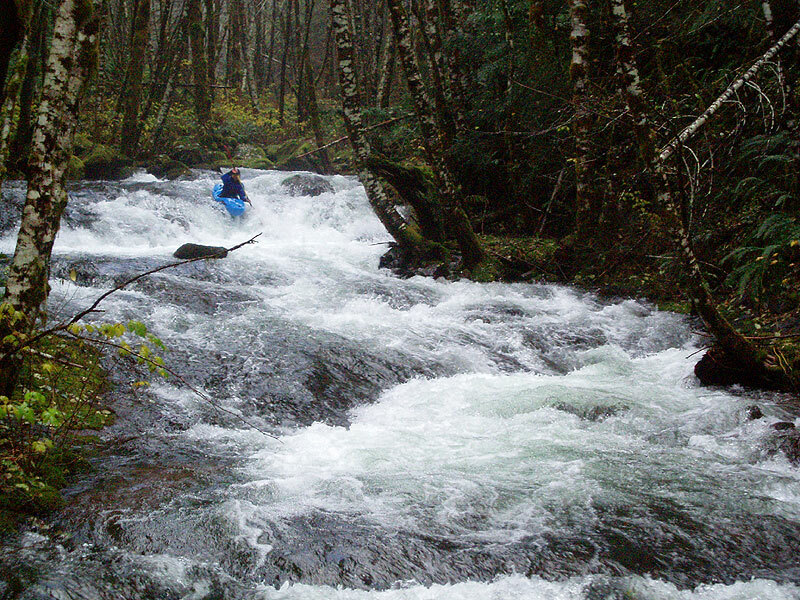 In spite of the access problems, Pete has focused intensely on this entire drainage, and he has spent many long days trying to dial in access to a variety of remote creeks in this area. His biggest near-debacle in the Boulder creek drainage happened during his original scout of Boulder itself, and was immortalized in his hilarious story drive. After many map recons and several scouting missions, we were more than prepared when the rains finally coincided with Elk hunting season. Pete and I rallied early, knowing that we were facing a long hike in, questionable roads, and probable snow. A nice view during the long drive in to Boulder Creek. Soon we were hopelessly lost, as is usually the case when we come to the Coast range. 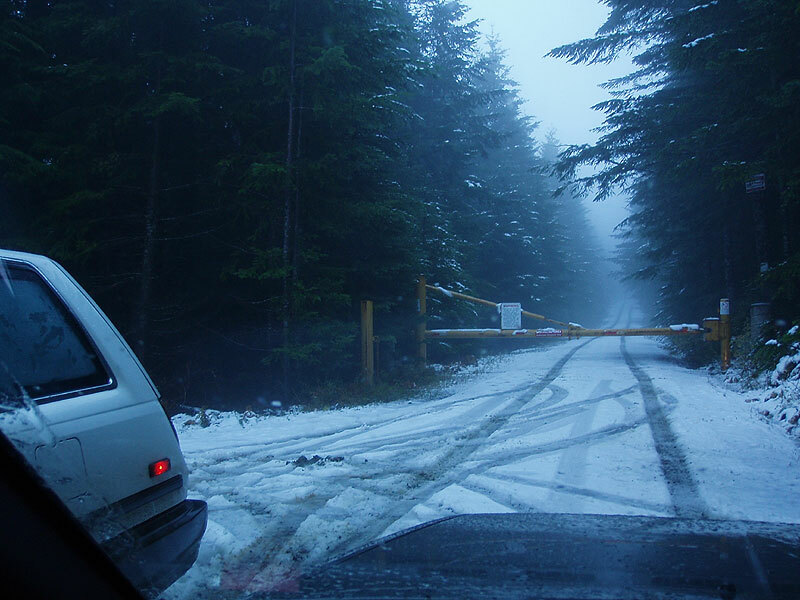 Our only hope was our GPS, which kept us more or less on track, though we still encountered some dead ends and gates. Even Pete, who has driven around this part of the coast range a lot, was starting to get confused. Not a good sign..
One of several wrong turns we took on the way into Boulder.. we were kind of lost at this point. This shuttle is not for the faint of heart or directionally challenged. Finally we located the take out, where a spur of a spur of a fork of a road comes down near the creek. We dropped my car, and headed back upstream. Finding the put in was another story. As I drove Pete mumbled and grumbled over the map. Never a good sign. I caught snippets of "Don't think that will work.." and "Nooo.. nooo.. hmmmm..", none of which boosted my confidence. Finally we got a good read with the GPS and pulled off to the side of the road. "Well, this looks like the creek." Pete said. I looked and listened hard, but there wasn't even a hint of noise or any sign of a creek emanating from the seemingly impenetrable wall of trees facing us. We were high on a ridge line, and it looked like a very long hike to the creek. "Maybe a mile or so, four-five hundred feet of drop til we get to the creek.." Pete guesstimated as the rain started to fall. That sounded pretty reasonable. "Not sure where we'll be dropping in though. Might be a tributary or something.."
Pete gets ready to begin the long descent into the headwaters of Boulder Creek. 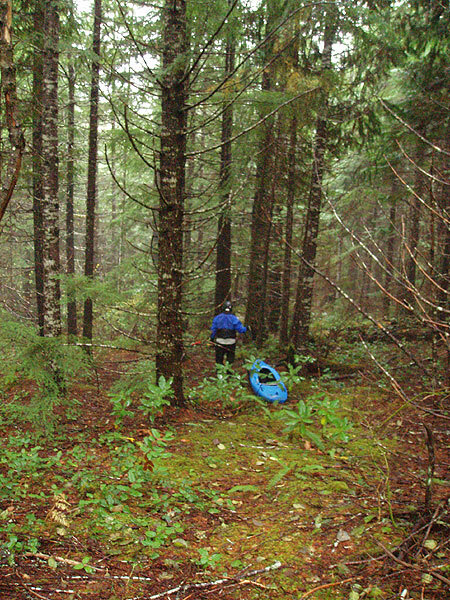 After about forty minutes of sliding and crashing down through rain-slicked Rhododendrons and thick firs we arrived at the creek, or some version of the creek, because it looked pitifully small. However, we could see another trib coming in just downstream, so we walked down the creek for another couple hundred yards until the creek doubled in volume and looked boatable. We finally reached the headwaters of Boulder after forty-five minutes of hiking. And then.. had to keep hiking downstream until we had enough water to put on. We finally put on the creek where several smaller forks converged. We knew from looking at the maps and the volume at the take-out that the creek would quadruple in flow by the end of the day, so we weren't too worried about water. The creek was open and fast-moving at first, then the trees thinned slightly and the brush closed in, forming dense 'tunnels' over the creek. We were very high in the headwaters of Boulder, so it is unlikely the creek ever floods up there and clears things out. The thick brush definitely made for some sketchy boating as it was difficult to see very far downstream..
Pete descends through a typical 'tunnel-o-brush' rapid on the upper section. It went on like this for about a mile..
We were very grateful to be wearing facemasks as the thick creekside brush went on for almost a mile and the branches drummed a steady cadence across our faces as we paddled downstream. Finally, after much tunneling, the brush peeled back and we picked up a trib or two and some volume. Downstream of here were some good rapids, nothing big but super fun stuff..
We finally reached the good stuff after much tunnelling through the brushy bits upstream.. The creek increased in volume as we moved downstream. The rapids were sustained and quality, but never harder than class four. After all of the aforementioned tunnelling we didn't mind, it was nice to run some good rapids! Soon the creek consolidated and started speeding along over bedrock. We proceeded cautiously, because everything was pointing towards a waterfall. After some smaller slides and drops we eddied out above a big horizon line. 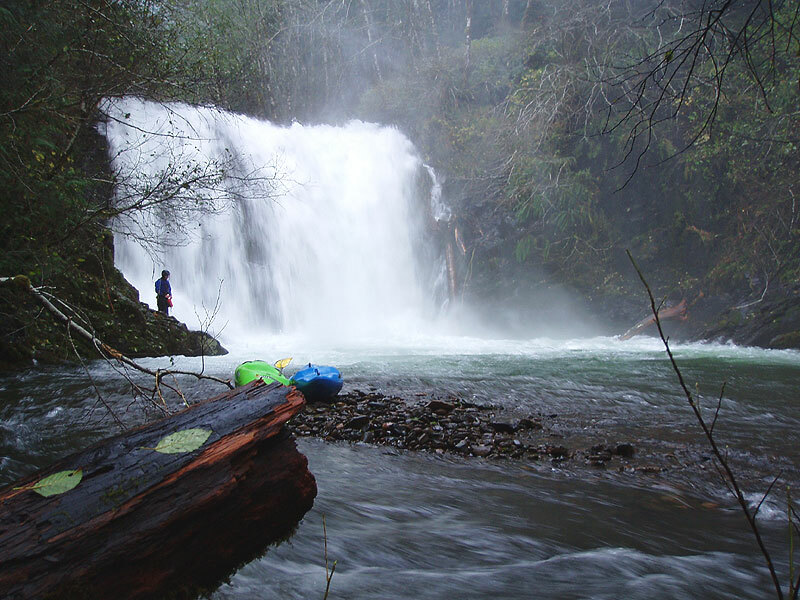 We had to stop well upstream because there was a large rapid leading right into a really big falls. We could see an eddy above the falls, so we decided to try and stop just above it. Pete went first and caught an eddy about thirty feet upstream of the lip, then got out of his boat. I came down next, driving over towards the eddy on the creek-right side. I could see a hump of water just upstream of the eddy, and I thought I would be able to boof over the hole behind the hump into an eddy just upstream of where Pete had stopped. This turned out to be a mistake, because when I went over the hump there was a rock in the landing that bounced me backwards into the hole, which turned out to be terrifyingly sticky. The creek was positively ripping past me going over the falls as I surfed the hole and tried not to panic. I could feel myself being forced back out into the main current, which would mean a blind probe of what looked like a forty or fifty foot drop. Pete was frozen on the bank, staring at me intently, unable to do anything but watch. Finally I managed to work my way out of the hole and out into the eddy, but I was pretty rattled. Pete came up and grabbed my stern and I got out, knowing that I had dodged one on this particular day..
Pete checks out the chaotic lead-in to the big falls on Boulder Creek. I almost ran this one blind when I got stuck in a hole just to the left of where this photo was taken. The portage wasn't too bad considering the size of the falls. We scouted it out without boats first, and determined that we needed to ascend away from the creek well before the falls to avoid the rock walls near the lip. Once up on the flats we made good time and then used our ropes to lower our boats and get back down to the creek. We looked at the falls for awhile and decided it looked pretty runnable, and I'm sure if Jesse Coombs or Mike Long would've been there it would've gotten run. 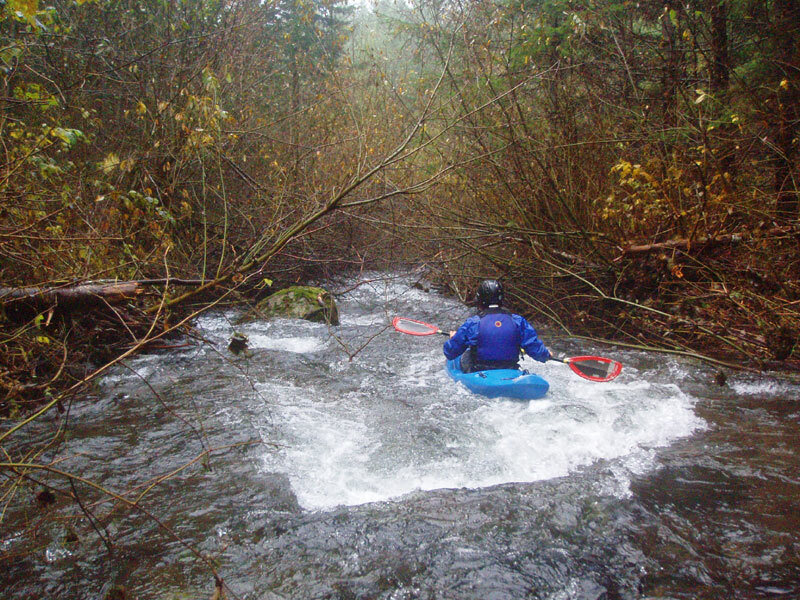 It was too big for either of us though, so we continued downstream. Pete packs up his throw rope below the big falls on Boulder Creek. Immediately downstream of the falls the creek really started cranking. There was a class five drop with some huge holes and wood which was pretty dangerous, so we walked around it. Downstream of that sketchy section were some more clean and fun boulder gardens, pictured below..
Pete runs the last good rapid above the take out. We were feeling a little tired but overall pretty good once we got back to the car. It had been a pretty long day but other than my close call above the big falls it had gone about as well as we could have hoped. It is really a shame that Boulder doesn't have better access, I'm sure that paddlers would run at least the lower section regularly if they had the opportunity. All of that said, Boulder was a fun adventure. 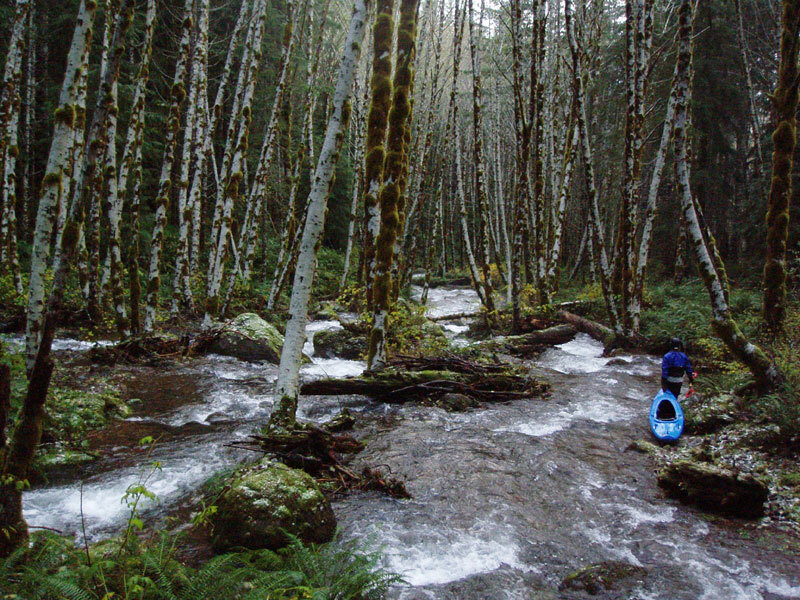 The creek actually didn't have much wood, and I remember running more rapids than portaging, always a big plus on an obscure Oregon creek. 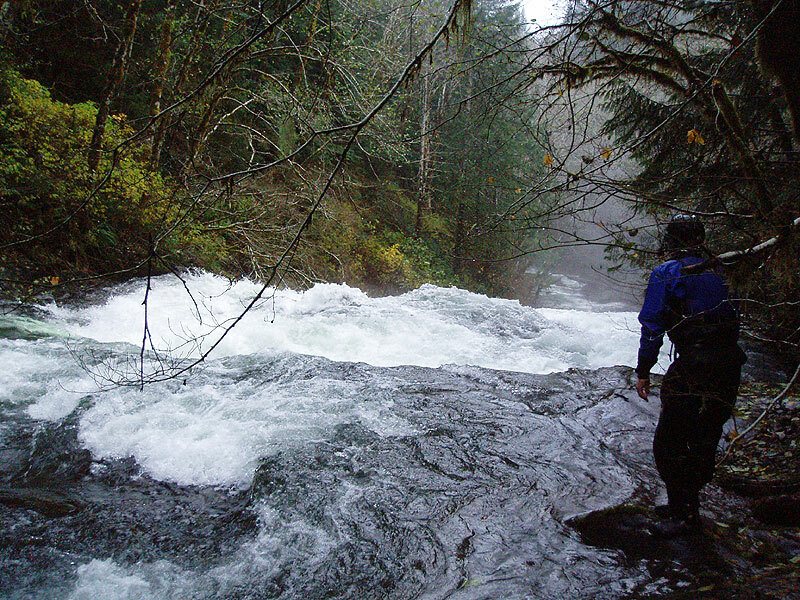 This creek is only accessible for two weekends a year during Elk Hunting season. As for access, I don't really remember how we got in there to be honest. I just followed Pete and hoped I didn't get a flat tire or something. 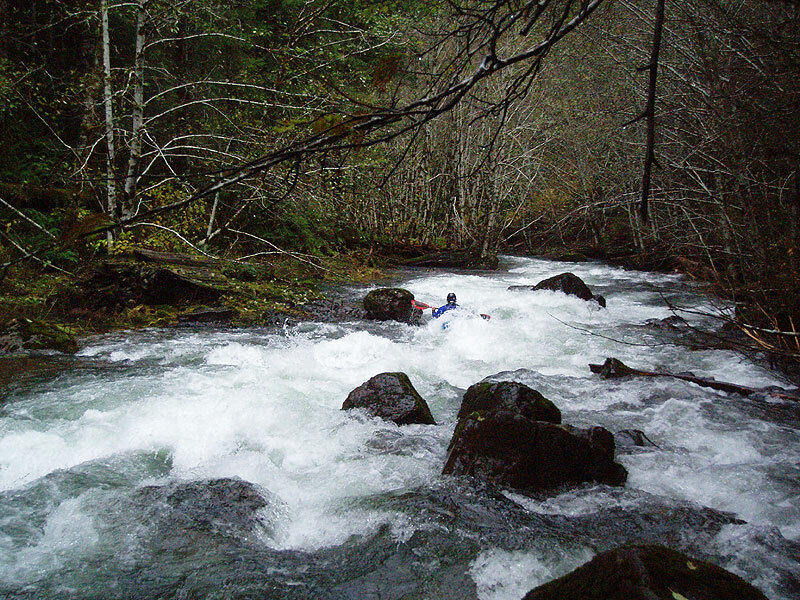 Boulder is one of the main tributaries forming the headwaters of the North Fork Siletz, due east of the tiny town of Dallas, Oregon. If you do try this one bring a GPS. Maps should be considered a good compliment to a GPS but should not be used as your primary navigation tool because the road system is constantly evolving. We ran this creek did on November 11th. The flows in the Siletz River at Siletz leading up to the day we ran this creek are as follows. As you can see, the ground was pretty saturated by the time we got there. Nov 11th: 6180 cfs ( The day we ran Boulder. So 6180 cfs with pretty saturated ground for sure. 3100 cfs is 6.56 feet on the gauge so 6180 has got to be in the 10 foot range on the Siletz foot gauge ). 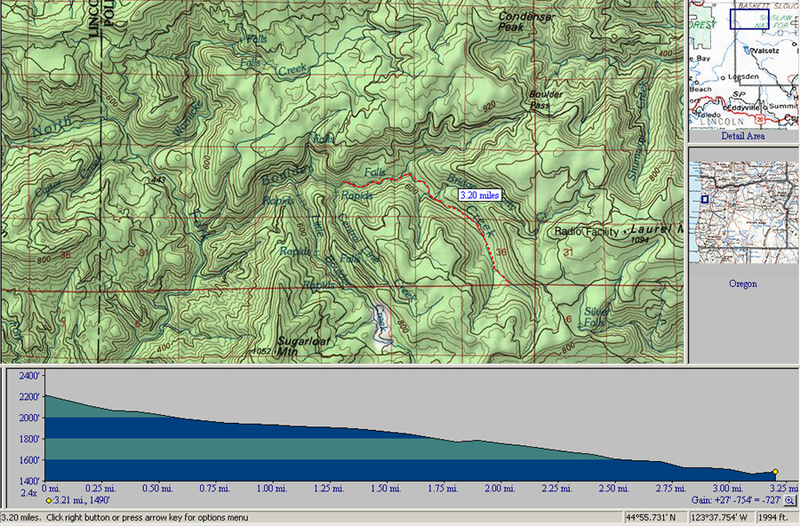 A map showing the section we ran. The big falls is actually marked on this software mapping system I use. We didn't continue down into the canyon because the road runs away from the creek and then you end up on the North Fork Siletz with a shuttle that defies description..